Boutique style tutus are so cute on little ones. My daughter has several tutus that I have made for her and she loves to wear them around the house and dance. I have been wanting to use up some tulle that I had left over from bridal and baby showers and decided I would use it to show you how I make tutus. Step 1: Measure your child’s waist. If you are creating this tutu as a gift, you can easily come to an approximate measurement by using their clothing size. If they wear newborn, you will start with 18 inches. Then, go up approximately a 1/2 inch for each clothing size they wear. 3-6 months would be an 18 1/2 inch waist, 6-12 months would be 19 inches, 18 months would be 19 1/2 inches, etc. I have found this method to be pretty close to true sizes. Step 2: Cut the piece of elastic. I lay the elastic alongside my measuring tape and measure out the waist size, then subtract about 3 inches and cut the elastic. The reason I do this is because when you add the tulle you will pull on the elastic and it will stretch out. If you don’t cut off enough, you can always rip out your seam later and re-sew it together to make it the correct size. Using your needle and thread, sew the ends of the elastic together. I usually overlap the elastic and then do a couple of straight stitches back and forth to secure the elastic from pulling apart. You can also do this on your sewing machine if you prefer. Step 3: Cut the tulle. I purchase the tulle that comes on the 3-inch round bolts and find it is the easiest to work with because then you only have to cut it lengthwise. For a tutu that is very full and is for an infant (less than 1 year of age) I usually cut the strips to be 14 inches long. This way when you double over the strips, the tutu will be the correct length (about 7 inches). If you want your tutu longer or shorter you can measure your child and determine how far you want the tutu to come down on their legs and double that number to obtain the correct length. Step 4: Wrap the elastic around a round object or your upper thigh. I have found that my large flour canister works well for a toddler tutu. This will allow you to work with both hands freely. Step 5: Tie the tulle onto the elastic. Fold your tulle strip in half and create a slip knot around the elastic. Pull tightly. As you continue tying on the strips, push them very close together so that you don’t see any of your elastic poking through. TIP: To create fullness in your tutu, alternate the direction of your knots. Here is a photo of how I do it. I tie on 5 of one color facing forward and then place 5 in-between those, going the opposite direction. Step 6: For my tutu I tied 10 strips of brown and 10 strips of pink until I got to the end. 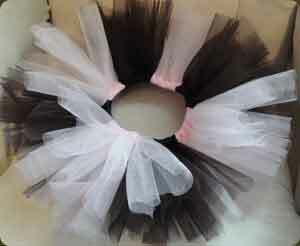 Try out different color combinations for your own personalized tutu. Step 7: Fluff out your tulle to create a full look. I like to scrunch it up a bit before I put it on her if we are taking photos. That is it! A very simple way to create an elastic-banded tutu! 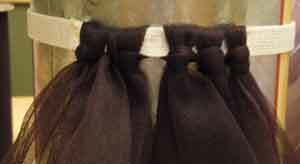 Add a ribbon bow in the front or tie ribbons in-between some of the tulle strips to create different looks. 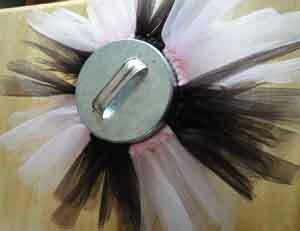 Below is a picture of the finished tutu while still on my flour canister. If you don’t know the child’s waist size, or simply don’t have any elastic, you can use ribbon in place of elastic. You would follow the same steps and then tie your ribbon very tightly in the front to close the tutu. They turn out super cute! She will love it! So cute. I must be tired because at first I thought it was how to make tofu, haha! Thanks for stopping by! I love hair accessories so of course I stopped by to enter! Thanks for letting me know! I have updated it to include the sewing on Step 2. Thanks for letting me know that needed added! You can actually use your machine to do this if you prefer, simply overlap the very ends of the elastic and stitch it together. I usually just stick to hand sewing so I don’t have to get out my sewing machine. 🙂 It lives in a box most of the time! haha!